Robert H. Liebeck, Ph.D., adjunct professor in the Department of Mechanical and Aerospace Engineering (MAE) and Senior Fellow at The Boeing Company, was nominated by Brigadier General Charles E. Yeager to receive the 2012 Brigadier General Charles E. “Chuck” Yeager International Aeronautical Achievement Award presented by The Engineers’ Council, during the National Engineers Week Honors & Awards Banquet in Universal City, Calif., on Saturday, February 25, 2012. The award was presented by Colonel Dawn M. Dunlop, Commander, 412th Test Wing, Air Force Flight Test Center, Edwards Air Force Base. 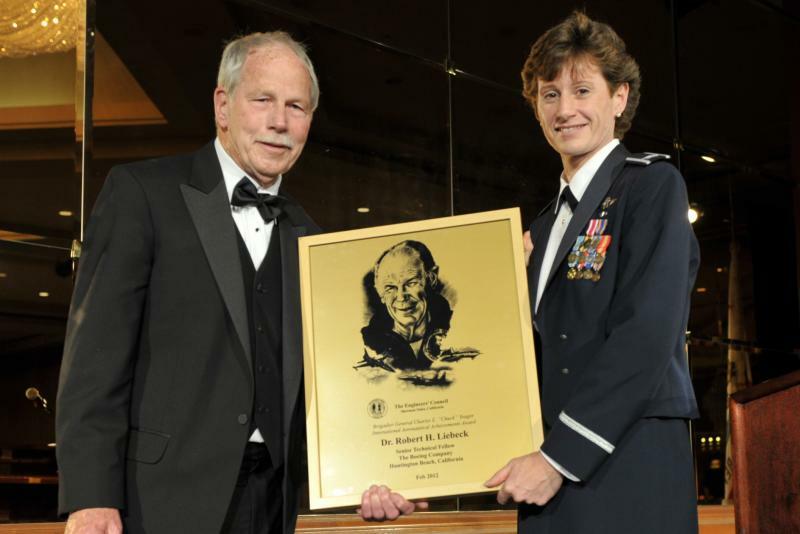 Liebeck is a member of the National Academy of Engineering, and a world-renowned authority in the fields of aerodynamics, hydrodynamics and aircraft design. He is the recipient of the 2010 Daniel Guggenheim Medal for “distinguished engineering as evidenced by the conception and development of Liebeck airfoils and blended wing body aircraft.” He also was awarded the 2011 “Engineering the Future” award from The Henry Samueli School of Engineering for his distinguished leadership in aeronautics, and his educational contributions to the Samueli School. In his long and distinguished career, he has held top positions at Boeing/McDonnell Douglas and has taught and conducted research at UC Irvine, the University of Southern California and the Massachusetts Institute of Technology. Liebeck has taught the MAE senior-year Aerodynamics /Aircraft Performance/Aircraft Design sequence at UC Irvine, and is involved in graduate and undergraduate research projects. He has also designed wings for Indianapolis 500 and Formula One racing cars, the keel for the 1991 America’s Cup winning yacht, and the wing for a World Aerobatics Championship airplane. Liebeck attained world recognition starting in the 1970s with his novel designs for high-lift airfoils, referred to by the aeronautics community as the “Liebeck airfoils.” He has made substantial contributions to a variety of related fields, including propeller design, windmill analysis, wing design for supersonic transports, and the design of high-altitude unmanned aircraft. He is co-developer of the Blended Wing Body (BWB) aircraft, a revolutionary design for subsonic transports. The BWB is widely considered as the next revolution in subsonic commercial transportation. It is a 450-passenger, “flying wing” aircraft with significantly lower fuel burn and noise than traditional tube and wing transports. The BWB is a top priority at NASA, and is under serious consideration by Boeing, to the point that a 21-foot model is currently being flight-tested at the NASA Dryden Flight Research Center (Edwards Air Force Base). In 1987, Yeager lent his name to what was then known as the San Fernando Valley Engineers’ Council, which has since annually presented the Brigadier General Charles E. “Chuck” Yeager International Aeronautical Achievement Award to individuals who, with the general’s concurrence, have attained historically outstanding achievements in the field of aeronautical flight test and engineering.